The exhibition takes place on 13-16 November in Abu Dhabi. Scientific and Production Firm “Paker” is a participant of this event once again. 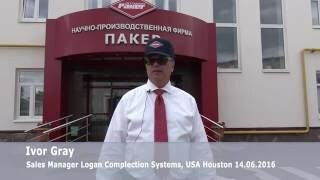 SPF Paker is among the national companies representing Russia at the international exhibition. Marat M. Nagumanov, Director of SPF Paker LLC, Dinar I. Sufiyanov, Head of Sales and Service Development in Foreign Markets and Zilya V. Dinmukhametova, Specialist of sSale and Service Development in Russia and Foreign Markets take part in the exhibition work on behalf of the Company. It should be noted that ADIPEC is the famous event of the oil and gas industry of the entire Middle East that was developed from the small conference of 1984 in the international event. Over 2200 companies take part in this year forum. Moreover, many companies expressed a wish to present their products at this international platform eight months ago. In 2017 ADIPEC is held in the renovated exhibition centre. Here, all conditions are created for the full-time work of the event participants. The special platform is open for exhibitors to present new equipment and machinery. Based on the photos, the visitors of the exhibition were very interested in the SPF Paker LLC stand, where the output product mock-ups - packer and anchor equipment for the oil and gas industry. The partners represented by PJSC TATNEFT came to the Company’s representatives. During the event, those who wish can have a look at the technologies and developments of SPF Paker LLC - in solving problems of production and injection, repair, completion and maintenance of wells. As well as the Company’s representatives prepared handouts - booklets of the output products. It should be noted, as in last year SPF Paker LLC was presented at the joint stand of foreign partners EMDAD LLC. The International Conference with presentation of technical reports is held within the frame of the exhibition. Here, actual issues in the field of oil and gas industry are brought up, and special attention is paid to the innovation. Equipment and technologies; oil and gas production; fields development; oil and gas products storage and transportation; environment protection; waste recycling; industrial waters treatment; soil contamination control; security system - these and many other questions were the keynote of the conference. It is notable that the participants of the International Exhibition were not only the oil and gas production companies but also consumers interested in raw materials or finished products. This forum is a unique opportunity for the international oil and gas industry to discover our company, establish new partnership and business relations. The exhibition work continues.